Beloved by graphic artists and beauty professionals alike and lauded for precision detailing, Iwata offers a variety of airbrushes and spray guns to suit any studio. In the collection below you will find high quality beginner's kits, individual airbrushes and spray guns to flush out the holes in your existing tool set, and compressors to fit your artistic needs. A favorite of both miniature painters and muralists, Kopykake offers airbrushes in a variety of sizes, and compressors renowned as quiet, unobtrusive must-haves. Highly versatile, Kopykake products can be used to spray anything the consistency of milk; your imagination is your only limit. Below is a collection of Kopykake products and pieces to build your own set, tailored to your specific requirements, without breaking the bank. Perfect for artists of all kinds, from comic and picture book illustrators to nail, makeup, and tanning professionals, the Iwata & Kopykake Airbrushes are top of the line, quality products that produce the best results. Very Popular and at great prices! Iwata Airbrushes are used by Illustrators, Graphic Novel Artists, Comic Book Artists, Body-Art Artists & More. Iwata Airbrush - the Premier Air brush! Iwata Airbrush - For extremely precise detailing of color. Choose from our selection of Iwata Air Brush complete sets and Iwata Spray Guns all on sale below! Including the Iwata Eclipse. What kind of artists use airbrushes? Professional artists, model enthusiasts, tanning professionals and more all agree that airbrushes are a great way to add variety to art. Airbrushes are capable of spraying all different types of products and materials to any color or desired shade. Modern airbrushes are compact, light weight and easy to transport. They are ideal for a professional artist or hobbyist who have issues with weight and space. 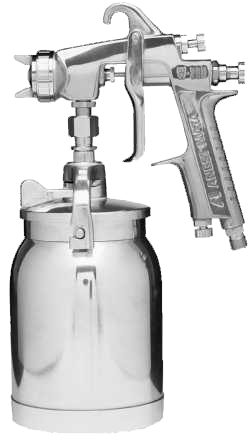 You can use our airbrushes and compressor for anything you want, put anything through it as long as it is of the thickness of milk. Airbrushing can work even for outdoor murals on concrete, as long as you have the right paint and the right consistency to spray on concrete outdoors. Pick the correct paint, and put a through layer of paint along with a good top coat, it should last for a long time. What is the difference between the Kopykake C3000-A Airbrush Air Compressor and Kopykake C3000-V Airmaster Plus compressors? Clean and Lubricate your Airbrush periodically. Providing Only the Highest Quality Products at Afforbable Prices for Over 30 Years! "The professionals preferred airbrush system!"